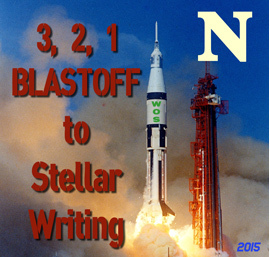 Narrative is a story’s fuel, and just like rocket fuel, if you use the right amount you head for the stars in style. Add too little, and you get no lift off. Add too much, and we know what happens, and it’s not good. To make matters more complicated, narrative is a compound – POV, dialogue, tense, voice and more all working together. Mix the ingredients wrong and you will spoil the formula. Keep it interesting and keep it moving. Too many writers slip into passive, telling prose without even realizing it. Dump those sentences with “to be” verbs and find better verbs. I never want to read another sentence with more than one “has”, “had”, or “was” in it. Please, just stop! Narratives with too many of these verbs read like someone is making a shopping list. And I shouldn’t have to say this, but here goes: show, don’t tell. You can describe just about anything in active and engaging terms, it just takes more work. When in doubt, cut it out. Chances are if you’ve started to question the number of sentences used in the description of anything, you’ve already gone too far. Most writers have a greater tolerance for our own narratives than their readers, so don’t overwrite. Keep Chekhov’s Gun in mind; never put a gun on the wall unless you intend to use it. I tend to mitigate this classic advice a bit. My theory is: hang the darn gun on the wall if it works to enhance the setting, but don’t tell me about the disabled firing pin unless you intend to use it. Don’t wed yourself to a single narrative formula. Unfortunately narrative formulas, like genres, rise and fall in popularity. A while back everyone wanted to write books in the first person, present tense formula. However, every writer’s strengthens are different. Every story project is different. Don’t become attached to a narrative formula that isn’t working for you and your story, find the one that works best instead. Every writer, agent and publisher wants to find the next great new voice. And the way a writer finds their voice is by experimentation and hard work. You will never find your voice if you’re always chasing the style of another writer or trying to catch a popular narrative style wave. You just can’t beat Mark Twain in fiction or in nonfiction for having a distinctive voice. His gift of using dialects, colloquial language, is unmatched. He could write for kids or for adults. He just nailed narrative is so many ways. If you don’t have the time or the inclination to reread some of his longer works (since most of us read them in school), read his short stories and get a feel for his unique style that way. Next I’m picking SOULLESS by Gail Carringer. This book pretty much put steampunk as a genre on the map. Prior to Soulless, steampunk lingered at the Sci-Fi fringes for decades, loved by some (like me), but it just couldn’t hit mainstream popularity. Carringer lifted it out of obscurity with her refreshingly witty style (clearly influenced by one of my favorite writers P. G. Wodehouse) and sparked hundreds (if not thousands) of copycats. This one was hard, we have too many posts to pick from. I’ll go with Heather’s Reading for Writers 101: Narrators. Robin: Great theme for the blog challenge. I’m working on my first novel and it’s a real challenge. I’m used to writing short stories, scripts and plays. Thanks, glad you like the theme. I think short stories and scripts are awesome, a perfect lead in to a novel project. Good luck with your story. I don’t write much poetry, but I will take you word for it. Glad you liked the post. My theory is every writer underestimates the amount of times they tell over show, or how often the default into passive. If I start out looking to hunt down and kill every single one, the few that slip by me will be insignificant. Thanks for the tips. I write strictly just for fun so I don’t follow the “rules”…or even know them. Might help if I did. The rules! Every writer hates them, but unless you’re talented beyond measure, the chances are they will help. At least when you’re starting out. Thanks for stopping by. This happens to us too. Heather and I did a short story thing last year and we both started out in third POV and ended up in first. I like to let the story pick the POV and write about 50/50 of each, but Heather likes first best. I think you’re right about the new story, insane characters are awesome in first person, we get to see the world from their wild (and slightly out of focus) eyes.